Senegal international footballer Diouf started his career in France with Sochaux-Montbéliard. He made his first appearance in 2-1 win against Bastia on November 12, 1998 before moving to Stade Rennais for the 1999-00 season. He moved to Lens the following season, spending two years at the Pas-de-Calais club before moving to English club Liverpool in 2002. Liverpool bought Diouf from Lens for £10 million, prior to Senegal’s impressive 2002 World Cup run. In the 2003/04 season, he became the first Liverpool player to wear the number nine shirt to fail to score a goal in an entire season. He made 33 appearances and went over 14 months without a goal. With long time friend Akon, Diouf founded his own charity to help under privileged children in Senegal. Goals by Egypt youtube video. egyptian football team 2008 with a nice song. 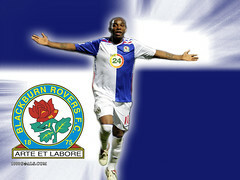 McCarthy is a professional South African footballer, currently playing for English side Blackburn Rovers. Playing for Seven Stars, the 18-year old McCarthy scored 37 goals in 29 games in the 1995–96 season, followed by another 24 goals in 20 matches, which earned him a transfer to Cape Town Spurs which two years later merged with Seven Stars to form Ajax Amsterdam feeder team Ajax Cape Town. After an impressive showing at the African Youth Cup and FIFA World Youth Championship, he joined the Dutch side, where he scored 9 goals and was crowned champion in his first season. After a relatively successful 1998–99 season he was sold to Spanish side Celta Vigo.